The season has started. Fishing is strong in all six ponds. 157 fish caught in the first four days with 13 between 20" and 25"! Check out the flies that worked. Streamers seem to be most productive at 1-4 feet deep with a slow retrieve. The recent warm weather confuses both anglers and fish. Neither can make up their mind as to what to do next. Try this, try that - first it works, then it doesn't. That my friends is why they call it fishing. Compare these numbers from 2012-2018 and make your own evaluation. Is there a "Best Pond"? Is there a "Trophy Pond"? Which pond has the best chance for success? Cedar Continues as Our Trophy Pond. However, your best chance for a true trophy fish (23" or longer) can be found in Cedar. 50% of Trout Caught in Birch! Fifty percent of our fish are being caught in Birch. The results are in – Fishing was great – Lots of gee whiz numbers! In the spirit of full disclosure, one of my favorite courses in college was “How to lie with statistics”. Often people see what they want to see and point only to the data that supports their views. The same information can be used to support conflicting opinions so go beyond the charts and look at the detailed data to see if it supports the conclusion. 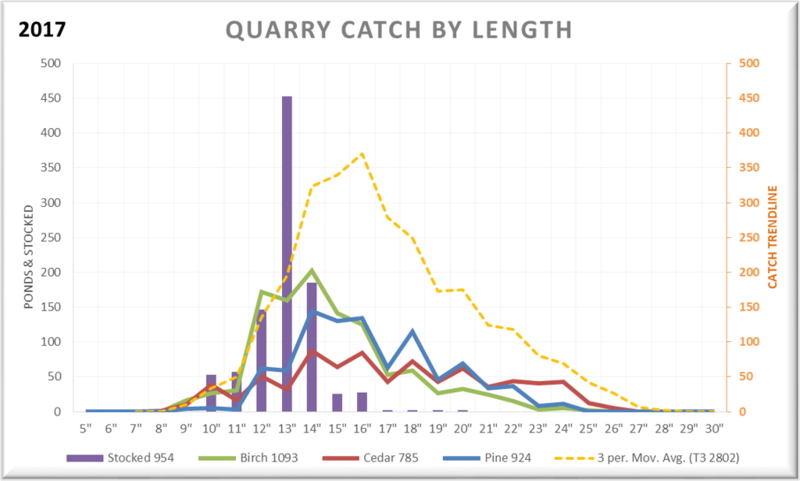 The data collected is from individual census sheets shows all the reported fish caught (1093/Birch, 924/Pine, 785/Cedar). At first glance, one might conclude it is easier to catch fish in Birch than Cedar. However, the time spent fishing a pond is not reported so the higher count in Birch might be a result of more time spent fishing rather than easier to catch fish. Are trout in Cedar smarter because they have been in the pond longer or did anglers spend less time fishing in Cedar? We get to spend a lot of time talking about where and how to fish (with adult beverage in hand). The good news is there are good opportunities for both the casual and the dedicated angler ... something for everyone! There were 234 days the club was open for fishing. 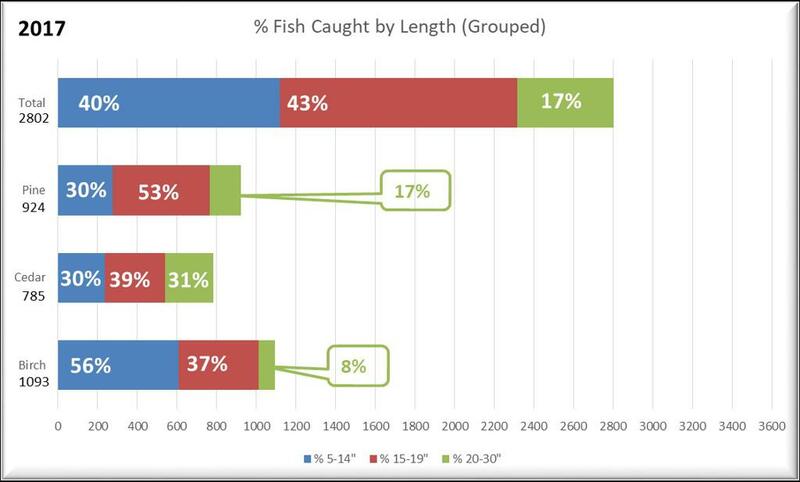 2967 fish were caught which averages 12.7 fish per day. 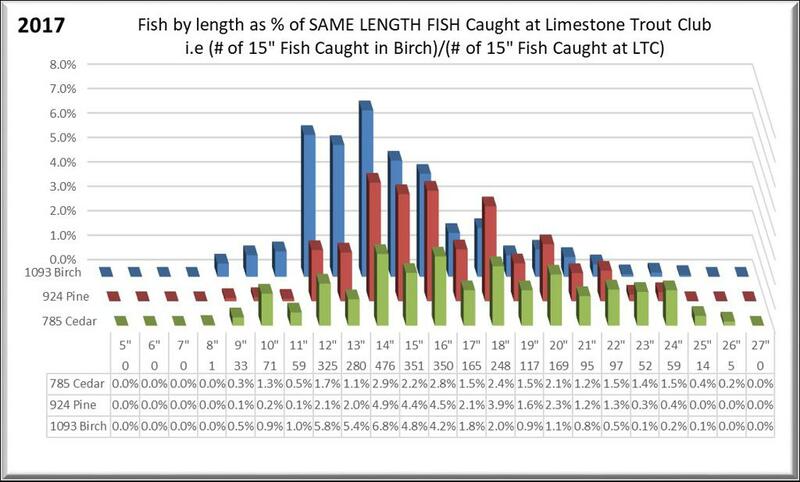 Most fish were caught in Birch - 1093. The average length of fish caught was 16.3 inches. Cedar had the largest average length – 17.6 inches. 92.8% of fish were released. NOTE: Looking at just quarry results yields different numbers. Which pond do I have the best chance to catch a fish? Which pond do I have the best chance to catch big fish on average? Which pond do I have the best chance to catch a trophy fish? Are holdover fish easier or harder to catch? Why? Does stocking change catching numbers? How? If so, for how long? Are fish harder to catch after feeding? Why? 2017 Catch Analysis - Provides background and details for the above material. Season Data For 2012-2017 - Shows catch data going back to 2012. Census Sheet Data and Analysis - A spreadsheet containing these charts plus additional charts and the raw data for years 2012-2017.